Simon Wachira is the founder of Proteq Automation, an advanced manufacturing company that makes CNC machines in Nairobi, Kenya, and the former Head of Engineering at Gearbox. In this interview, Simon tells us about his inspiration to become an entrepreneur, how he discovered digital fabrication, what manufacturers in East Africa are using his CNC machines to make, and how he balances the needs of investors and his company's cash flow while educating customers in a very new market. The fast pace of technology is bleeding into every aspect of contemporary life, including emerging artists experimenting with digital technology trying to make sense of the surrounding world. Both technology and art define and continue to reshape the world we live in. Re-imagining what we know as real or as a solid ground, pushes not only our opinions and understandings of nature to the limits, but with new inventions and experiments, both the mind and the body, the language, and the world itself seems to be making room for a different sphere and fresh rules. Governed by the new aesthetics, the virtual, the scientific and the logic that is beyond belief, technology in art challenges our perceptions and that is what creativity and science are all about. The change of artworks’ nature along with the shift in the public interaction and the reshaping of the museums and exhibition spaces are making more room today than ever before for some of the most amazing examples of digital art, kinetic pieces, and works that explore the internet and online existence. Gearbox was contracted to customize furniture for Drums for Africa, an enterprise that offers messaging solutions to meet the needs of organizations, who had their own desirable table design to compliment their brand. The design was cut on a sheet metal by a CNC plasma cutter at Gearbox and the parts assembled by our mechanical team as shown. We are living in the world of automation where all the activities are getting automated through the use of advanced programmable controllers in home automation and industrial automation systems. An automatic school timer system reduces the effort needed to turn on or off an electric bell manually that gives alarm for certain intervals of time based on school timings. This automatic system is a micro-controller based project that uses a simple basic microcontroller, which makes this product affordable. Oki Agaya Okwiri discovered his interest in building unique bells in 4th year when he built a simple bell for then Lavington Primary school during his volunteer work. After completing his bachelor’s in electrical and electronics engineering from Nairobi University, he got exposed to Gearbox that gave him the tools and resources to build better. With Nick Kimali, an electrical engineer, they built an automated programmable school bell for Kids Zone Educational Center at Kikuyu, Nairobi. This automatic school bell timer system is designed using a basic microcontroller for managing time intervals. Read or Write memory is also necessary for storing bell timings, and it’s uploaded with melodious tunes for a ring tone (cartoon tunes) that is easily adaptable to the the kids. In future, Oki will improve the system to provide for software and a device to give user flexibility in uploading their school timetable and offer display of information in a seven-segment display for a user interface purpose. The Global Innovation Index (GII), which measures growth in the multi-faceted dimensions of innovation, placed Kenya among the top 5 most innovative countries in Sub-Saharan Africa in 2017. In East Africa, Kenya was in the lead with a score of 31 points, followed by Tanzania (28), Rwanda (27), Uganda (27) and Burundi (21) according to the survey. Kenya’s advancements in FinTech, Telecoms, and other sectors, have been lauded across the continent and around the world. Yet to maintain this upward trajectory, a balanced regulatory framework and support from a diverse set of actors will be critical to eliminate the risk of slowing innovation. In the fiscal year 2016/17, the Kenyan Government spent Sh3.5 billion (equivalent to 0.05 per cent of its gross domestic product or GDP) on research, science, technology and innovation combined. The adoption of the Science, Technology, and Innovation Act 2013 prioritises the development of science, technology and innovation through the Kenya National Innovation Agency, the National Research Fund (NRF), and the National Commission for Science, Technology and Innovation. The Act also provides that the Kenyan Treasury should allocate two per cent of the country’s GDP to the NRF, which is yet to become a reality. Apart from funding, Kenyan entrepreneurs often lack dedicated resources that are critical for product design and development. Many entrepreneurs in the country have an abundance of brilliant ideas, but lack the tools and space to design and make products, and the training and mentorship to advance their enterprises. For hardware entrepreneurs, it is especially difficult to develop polished prototypes that can attract external investment and drive business growth. With an eye on this market gap, Gearbox, a centre for hardware prototyping, stepped in to provide entrepreneurs with the appropriate tools and training that will improve their creative journey. With a financial grant from the Autodesk Foundation and donated software from Autodesk, Gearbox can provide mechanical and electrical engineers and makers with the software and training they need to create - while saving them time and money. Founded and facilitated by qualified engineers and certified trainers, Gearbox provides a space for individuals who are skilled but do not have access to the kind of machinery that they need to make their products. Members have access to welding equipment, 3D printers, CNC machines, laser cutters and more. The rapid evolution of technology is disrupting almost every industry providing Kenyan entrepreneurs with significant benefits in terms of cost savings and improved design and development. In the world of engineering, makers can shave off half the time spent on analysis and decision-making by leveraging new technologies. Reliance on traditional project management tools often results in lost productivity. By understanding the unique needs of designers and engineers, Autodesk has built cloud collaboration tools geared for design and engineering projects. Several start-ups addressing different societal needs are leveraging modern tools and space provided by Gearbox and are achieving success. The EsVendo Project is a good example. Created by Kenyan social entrepreneur Esther Mwangi, it aims to increase women's access to low cost sanitary products through the introduction of custom vending machines for as little as ten shillings. The project targets rural and urban settlements that have limited access to shopping malls, hospitals, and schools and has created a local solution to an issue by leveraging specific hardware technology. 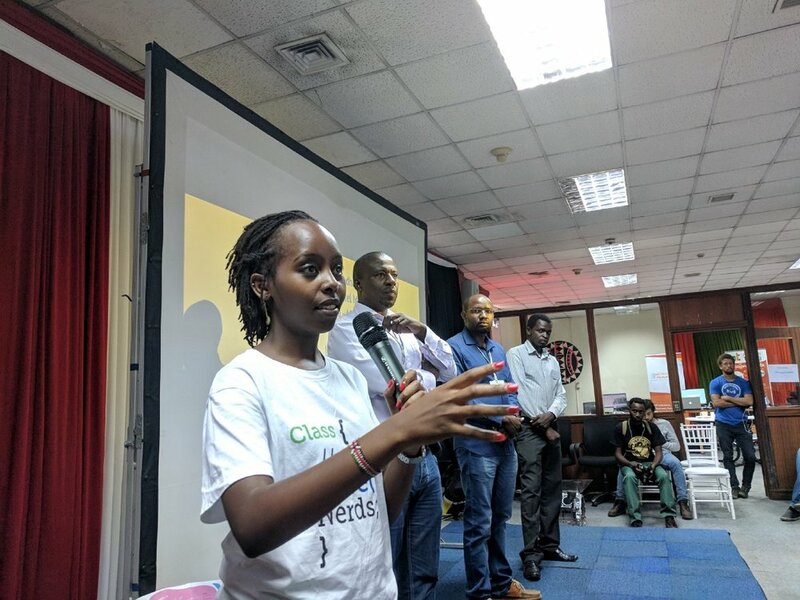 In addition, EsVendo has integrated vending tools with mobile SMS technology to educate and inform customers, and lower the cost of sanitary towel delivery to women living in Kenyan slums. For innovation to continue to flourish in Kenya, it is essential to create an environment that is conducive for entrepreneurs to make their ideas a reality. No single party can accomplish this objective alone. The public sector, private sector, and academia need to work together to cover existing gaps in physical resources, mentorship, and financing to keep fuelling the upward trajectory of innovation in the country. Conflicts between people and wildlife currently rank amongst the main threats to conservation in Africa. In Kenya, for instance, with much of the wildlife living outside protected areas, one of the real challenges to conservation is how to enhance and sustain coexistence between people and wild animals. Flashing lights - The flashing lights systems are motion activated lights that blink severally once a trespassing elephant approroaches it. This intimidates the elephants and keeps them away from peoples territories. A chillifumer – Since chillies irritate elephants, providing an unpleasant experience, the chillifumer generates chili fumes that keep the elephants away without harm. Gearbox continues to offer hardware solutions to local problems. Gearbox is adding training to the membership and contracting services it provides. With the training came the hackathon idea to help spread word on the training and the courses we will be providing. On 26th January 2018 we held our very first Hackathon at Kenyatta University, at the Kenyatta Business Innovation and Incubation Center Training room. With over 70 registrations for the hackathon, we had a turn out of 33 students. A brief introduction was given by our Head of Contracting Eng. William Maluki shortly after Eng. Nicholus Kimali talked in detail about the training and the type of courses we will be providing. To kick off the hackathon and with no limitation on the type of projects they were to work on, students were put in groups of three. After about two hours presentations were made by the different groups and winners were announced. With an initial intention of providing four slots for sponsorship; two full scholarship and two partial, whereby the partially sponsored students would pay an administration fee of sh.15,000 instead of the full training fee of sh. 40,000 for students, we ended up giving nine slots! Two full sponsorships and seven partial sponsorships. The full sponsorships were given to Sylvia Ngari and Fidel Makatia whereas the partial sponsorships were given to Cynthia Thuo, Mercelyne Kipngetich, Martin Wabende, Kiplimo Elijah, Tony Alvin, Ronald Kimutai and Jonah Ethan Mutamale. The Gearbox Mechanical Lead chats to us about the space and creating more space for women in the African tech sector. The number of technology hubs across Africa have more than doubled in less than a year, according to Quartz. One of the spaces that is adding to this advancement is Kenya’s Gearbox. An initiative aimed at improving the ecosystem for hardware entrepreneurship in Kenya, Gearbox is one of the largest maker spaces in Eastern Africa. Founded and facilitated by qualified engineers and certified trainers, it provides a space for individuals who are skilled but do not have access to the kind of machinery that they need in order to make their products. Members have access to welding equipment, 3D printers, CNC machines, laser cutters and more. More than this though, Gearbox also offers a range of opportunities for training, mentorship, and networking while also hosting community forums and workshops in an effort to further their reach. The mechanical lead at Gearbox is Brenda Livoi. 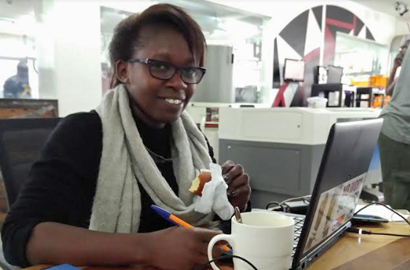 She graduated in mechanical engineering from University of Nairobi and now occupies one of the top positions at Gearbox. Though it is a position that she tells me she derives immense fulfillment from, she remains one of the few women in this kind of leading role in the sector. Still, things are improving, she says, citing the larger amount of women students who she has seen come into Gearbox and make their mark in the environment. “I think women have it in mind that they are trying to make it in a space that is not historically theirs, so they work extra hard and always give their best and are very hands on,” she adds. Take The Esvendo Project. Created by Kenyan social entrepreneur Esther Mwangi, it aims to increase women's access to low cost sanitary products through the introduction of custom vending machines for as little as a ten shilling coin. One of numerous startups initiated at Gearbox, it is targeting rural and urban settlements that have limited access to shopping malls, hospitals and schools and has created a local solution to an issue through the leveraging of specific hardware technology. Located within an industrial area in Nairobi that is easily accessible, Livoi describes Gearbox as “a factory of factories.” An enormous, 23,000 square foot space, members are able to utilise the shared workspaces and machinery, while numerous companies of varying natures can rent permanent office spaces there as well. This creates a particularly unique ecosystem, wherein individuals and businesses can network, share their ideas and potentially create a meaningful commodity together. 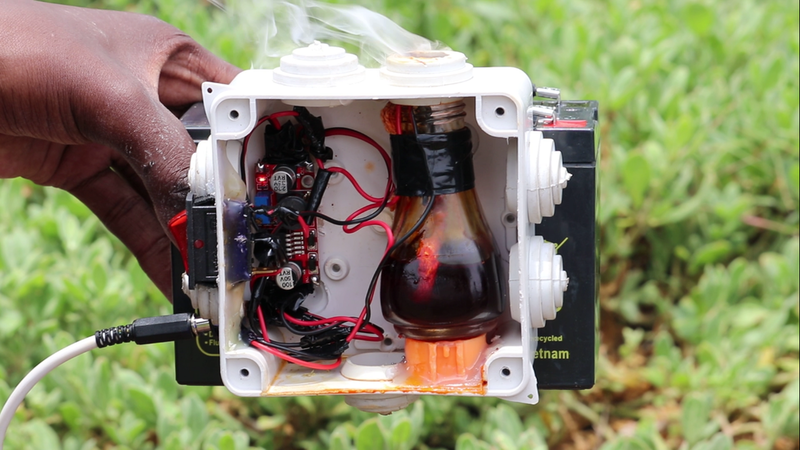 Started by a group of local Kenyan “makers” and education professionals – including executive director Dr. Kamau Gachigi – Gearbox was created in response to the vast number of good ideas that they saw developed by students that simply ended up being discarded due to the lack of resources to further them. “People have ideas,” says Livoi. According to Livoi, when accepting new members, Gearbox looks at two things. First, they require a degree of self-motivation from those they admit and, secondly, they want individuals who – whether they possess previous training or not – are open to learning new ways of processing. In an effort to further expand their reach toward the nation’s students, Gearbox launched the “Fab Academy” programme in early 2017. An extension of the Fab Labs programme – which began as an outreach project from MIT’s Centre for Bits and Atoms and has grown into a global network of more than 500 labs – the Fab Academy teaches principles and applications of digital fabrication. More importantly, it takes these teachings to those that can’t necessarily reach Gearbox's Nairobi location, increasing the general access to these lessons in innovation. At the heart of Gearbox is the notion that knowledge sharing can bring about innovative solutions to the challenges that we as a continent face. By fostering a do-it-yourself spirit within a community, they’re making it possible for anyone to manufacture what they want to right here within our borders. For this reason, Livoi doesn’t think it will be very long before the term ‘made in Africa’ is applicable to traditionally imported goods, but she’s firm in her assertion that for this to happen we need to start believing in the potential of our people and putting our money where our mouths are. In a period where there is an estimation of 4.9 billion sensors connected to the Internet, the topic Internet of Things is bound to rise, and it did. On 8th December 2017, we held a conference in collaboration with Thingscon at Gearbox, the ThingsConNBO. On 8th December, we held ThingsCon Nairobi. It was a special event for ThingsCon as an initiative — but also for me personally, as we pushed for this to happen ever since the very first ThingsCon in 2014. Also, ThingsConNBO took place exactly one week after ThingsConAMS, which allowed me to continue the discussions that we had in Amsterdam — and get a clear understanding about the shared views, and the differences between the European and the African perspective, when it comes to building a responsible Internet of Things. On a general note, ThingsConNBO was one-day event, supported by Gearbox, a Nairobi-based maker space, the German Agency for International Cooperation (GIZ), and r0g agency. It featured a pretty diverse set of speakers and projects on stage: from Gabi Agustini from OLABI, São Paolo, to David Li from Shenzhen Open Innovation Lab, to Stephen Kovacs from r0g Berlin, to many incredibly dedicated speakers and entrepreneurs from Africa, including Jeff Muthondo of BRCK, Nick Quintong of PayGo Energy, and from South Sudan, now Uganda, and Abdulmalik Adam, Elizabeth Ondula from Kenya, all making for a throughly inspiring and fun event. I held the opening keynote on perspectives “Toward a responsible IoT”, underlining the growing relevance of collectively understanding and discussing the things and systems we are building. This includes the pitfalls and challenges that come with it, namely Gadgetism, Vanity Products, Hype Circles, Security and Privacy concerns. As a perspective I highlighted the importance of 1. Purpose and Principles 2. Tools & Methods and 3. Openness & Diversity to address these challenges. As Gabi highlighted in her opening, the role of diversity, inclusion, and openness cannot be overstated when building global networks (of things). This is not only true when it comes to deciding how we go about decision in design and manufacturing of IoT products, but also and maybe more importantly when deciding why, for whom, and by whom those products are built. I’m all the more happy, that with ThingsConNBO we managed to broaden our own circle of discussion a little bit, learning and involving voices from thoroughly different contexts and scenarios. And while this diversity might very well lead to conflict, inefficiencies and costs along the way, I wonder how we can go ahead and ensure that the benefits of clearly identifying and understanding specific problems of users and communities, surely outweighs these trade-offs. Applying and embracing open and participatory design practices can provide a robust way forward to address these challenges and include all stakeholders from step one. As David Li pointed out, building things just doesn’t cut it anymore. Shenzhen’s ecosystem is way ahead of the world, making for 90% of the global manufacturing of electronic devices, with products and iterations churned out at every thinkable niche and alternation. It i a somewhat brute force way to innovation, that might herald actual results, its downsides are apparent — with vanity products and seemingly useless gadgets rolling from the belt. Dr. Kamau Gachigi, Founder of Gearbox, pointed out, that what seems to be a Gadget (as in: and useless product) here does not mean to for it to be a Gadget elsewhere. Usefulness lies in the eye of the beholder and certainly the beholder in Africa is rather open to re-using tools and products at hand. The basis for building a human-centered Internet of Things is to identify relevant problems. A particular take on those specific and highly relevant problems was provided by the team around Jaiksanda José and Abdulmalik Adam, who both fled from Juba, South Sudan, due to violence and unrest. They joined forces with Berlin-based r0g agency for open culture and designed the „Access to Skills and Knowledge Kit“ (#Asktoek), basically a portable maker space, that not only allows people in refugee camps and equally dire situations to proactively solve their own challenges. It also provides powerful and hands-on STEM education and is completely open itself. Its an inspiring project that adds a new level to „building a responsible IoT“. Applying Open Source principles to conflict settlement, peace and even state building seem incredibly challenging and promising at the same time, and I would love to dig deeper on that end. And #Askotek is not alone: products and companies like PayGo, allowing to micro-transactions for Gas due to a connected valve, and BRCK, a rugged, autonomous wifi-router to connect “the last mile” go in the same vein: while the actual hardware might not be built here, the problems are identified on the ground, and the solutions, too. This shift has powerful consequences. The growing need to identify problems worth solving in combination with a global manufacturing powerhouse, called Shenzhen, not only provides easy-as-ever starting grounds for hardware companies around the world. It also shifts the relevance of businesses toward a thorough understanding of problems in specific contexts. A human-centered business is one, that solves relevant problems on the ground — and make use all whenever resources are available to bring that solution to market, however global those solutions might be. I was happy to join in quite a few discussion at and after the event to explore, what an innovation economy that de-coupled understanding and manufacturing could look like, for better or worse: As promising these opportunities might seem to local entrepreneurs, as dire the consequences of a re-vamped industrial globalization might be, from questionable trickle-down effects in the manufacturing side of things to vanity products and equally challenging competitive effects in communities around the globe. I can’t wait to pursue these questions further with the truly global ThingsCon community and beyond. For the record, ThingsCon NBO was part 1 of a back-to-back event. Round 2 will happen in 2018 in Germany and continue these discussions. You should come and join us! An estimated 4.9 billion sensors are connected to the Internet and that number is estimated reach 38 to 50 billion in just five short years. This is what’s broadly powering the Internet of Things (IoT). Connected cars, connected logistics, connected clothing,connected everything. Gearbox has partnered with Thingscon to bring you the leading conference on IOT connected devices and the future of hardware. Wandia solders the control board for a PCB etching monitor in the electronics lab at Gearbox Lite. Turning the things they make into economic impact requires a specific kind of makerspace, however. While it is open to everyone regardless of what they are making, Gearbox is designed to serve the needs of hardware entrepreneurs — those launching a business around designing and making physical, manufacturable products. Broadly speaking, we’ve found three things that make a makerspace useful to hardware entrepreneurs in Kenya: space, tools, and people. The space needs to be physically large enough to build large projects (like a farm-scale biogas digester), host a small team, handle inventory, or set up low-volume assembly lines. It needs to be polished enough to host meetings and welcome clients, and should have amenities like conference rooms and breakout spaces. At 100 square feet per member, 20,000 square feet is a rough lower boundary for a space with 200 active members — enough to begin to build a viable sustainability model for the space itself. The equipment needs to be of professional quality. While consumer-grade laser cutters, 3D printers, and desktop CNC machines are getting better every year, few can stand up to 12 hours of daily use by members of varied skill levels. A makerspace’s equipment gets beat up fast, and the tools need to be able to handle abuse, especially when replacement parts can take weeks or months to arrive from overseas. Keeping all of that equipment in working order requires a full-time professional staff. The difference between a well-tuned band saw and one with a wobbly blade can be the difference between a prototype that’s polished enough to show to an investor, or hours of struggle to make anything that doesn’t look like an amateur affair. Gearbox’s staff don’t just keep the machines working — they teach members why and where details and precision matter; they design and build prototypes for contracting clients; and they make sure that Gearbox is always a friendly and welcoming space to everyone, no matter their background. They are at the heart of everything Gearbox does, and the main reason members and clients come back. These three things — a physically large space, high quality equipment, and a full-time professional staff — are the key components of a makerspace for hardware entrepreneurs, and assembling them in a place like Kenya is not easy. Tools and equipment are hard to find and expensive to import, infrastructure like electricity or internet are unreliable, regulatory processes like starting a company or nonprofit are lengthy and opaque, and engineering talent can be hard to find and harder to keep when competing with industry. A fully equipped, 20,000 square-foot or larger space will cost $3 to $5 million dollars to build. Anything less is likely to fall short of the goal of helping entrepreneurs take their ideas from prototype to market at any significant scale. The term “makerspace” captures the core of what Gearbox is — a space for people who design and make things — but it is not a term that sits easily even within Gearbox’s own community. To many of the designers, engineers, and entrepreneurs who have passed through Gearbox Lite over the last two years, the term “maker” implies a hobbyist or tinkerer, and generally holds a connotation of unprofessionalism. Outside of Kenya, the word “makerspace” often gets conflated with related terms like “Fab Lab” or “hackerspace.” For the uninitiated, Gui Cavalcanti wrote a helpful description of the differences between these kinds of spaces in Make Magazine, although his definitions are still far from universally applied. In the US, places called makerspaces are popping up in schools, libraries, youth centers, and corporate headquarters, and can range from a small room in an elementary school with a 3D printer and papercraft tools, to a space like First Build in Louisville, Kentucky, with 35,000 sq. ft. of advanced prototyping and low-volume manufacturing space. First Build’s shop floor in Louisville, KY.
What most of these spaces have in common is that they are open to the public, and they provide tools for making physical things. By being open to the general public, Gearbox has seen people with a tremendous variety of backgrounds pass through its doors. Students and lecturers have collaborated on business models growing out of shared research; local business owners have come to seek out talented designers and engineers; Kenyans from “up country” have traveled hours to use the machines to make tools or parts they can’t find elsewhere. By providing access to tools, space, and skills that are hard to find in Kenya, Gearbox has seen projects that range from medical equipment (Sato’s foetal heart rate monitor), to novel water treatment systems (Usafi Comfort), to tools for preventing human/wildlife conflict (#Innovate4Wildlife), to agricultural technology (a low-cost chicken brooder that alerts farmers to problems via their mobile phones). The list of the continent’s woes rattled off in the executive briefing may sound familiar: Africa has the youngest population in the world (60% are under 25); 15–20 million new youth are set to join the workforce every year for the next 30 years; despite being better educated than ever (52% are expected to have a secondary education by 2030), there is a huge mismatch between the skills employers are seeking and those possessed by young graduates. In addition to these familiar (and daunting) challenges, the report focuses on a striking and relatively new concern — that many African economies are more exposed to disruption by new technologies than many realize. Richard prepares his job shop’s CNC router in Nairobi for a contract from Gearbox. Concern about Africans’ uptake of technology is certainly not new, but the report hits on two aspects that are noteworthy: 1) the sheer scale of the demographic challenge — half a billion new 18 year-olds looking for work by 2050, and 2) the nature of the work they’re likely to find. Last century’s transformations across Southeast Asia had a similar theme as the first industrial revolution in Europe in the 1800s, shifting large numbers of agricultural workers towards wage labor in factories. The future of Africa’s industrialization is unlikely to follow the same path. Demand for the kind of low-skilled, labor intensive manufacturing that reshaped much of Asia is not set to grow at the same pace as the world’s workforce. New manufacturing technologies created an explosion in global productivity per worker over the last fifty years, with the result that fewer people are needed to make things than ever before. The promise of the Fourth Industrial Revolution is not going to be more manufacturing jobs like the factory lines of decades past. The rapidly decreasing cost, ever increasing ease of use, and widespread availability of fabrication technologies like CNC machines and 3D printers are transforming the way the world designs and makes things. In the most optimistic point of view, using these tools just about anyone, just about anywhere, can learn enough (thanks to the internet) to make just about anything. How easy that is to do in practice is debatable, and it does not mean that what they make is necessarily going to translate into economic impact. New business models that take advantage of these trends are only just beginning to be developed, and how they will play out is far from certain (see Exploring the Maker-Industrial Revolution: Will the Future of Production be Local? by Anna Waldman-Brown). But at least in Kenya, a dramatic shift in who is able to design and make commercial products is causing a corresponding shift in whom these products are designed for. Young Kenyan entrepreneurs are focused as much on designing novel products tailored to local needs as on selling imports or exporting to larger markets. In this latest industrial revolution, the work of making things is less about rote manual labor, and value is created by designing new things that can be tailor-made for the people who use them. In the world of work soon to be populated by 500 million new young Africans, the makers of things best placed to benefit are likely to be those who can build a business model around the distributed manufacture, rapid iteration, and localized appeal of their designs. In other words, new African jobs will come from Africans designing and making products in Africa, for sale to other Africans. This is radically different from the export-led growth model that powered Asia’s boom, and supporting it requires a radically different approach. One model for doing so is a makerspace. In 2009, the University of Nairobi Fab Lab became one of the first places in Kenya where anyone could go to learn about and use the latest in fabrication technology, from 3D printers to laser cutters and CNC machines. In 2010, the iHub was founded as a gathering space for Nairobi’s tech community, bringing together designers, coders, entrepreneurs, makers, hackers, and global investors. 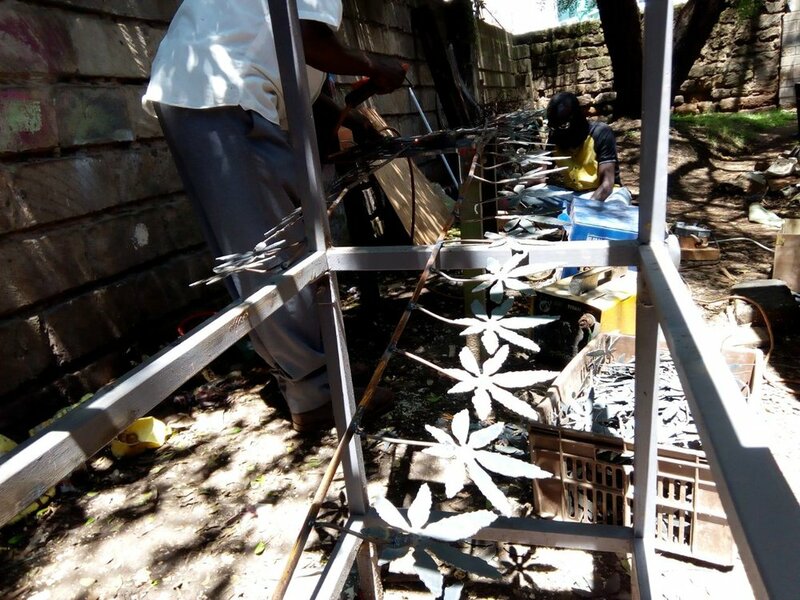 In 2013, the iHub was given a shipping container full of tools (a “shop in a box” including welders and a CNC plasma cutter), and working with the Nairobi Fab Lab and several local companies, launched Kenya’s first makerspace — Gearbox. From day one, Gearbox has aimed to be Kenya’s “open space for design and rapid prototyping.” Having started from a shipping container, in 2015 it grew into a dedicated 2,500 square-foot space called Gearbox Lite (see featured image). Now, Gearbox is kicking off a new chapter as a 20,000 square-foot makerspace in the heart of Nairobi’s Industrial Area. When fully built out (renovations started in March), Gearbox Industrial will host 9,000 square feet of private office spaces, 6,000 square feet of shared coworking, design lab, classroom, and event spaces, and 5,000 square feet of shared workshops featuring industrial grade equipment for working with wood, metal, plastics, electronics, and digital fabrication. Our interns have exciting learning experiences during their internship program with us as they get opportunities to see and have their ideas and designs come to life. They also get a chance to contribute to some of the ongoing project at the work space and workshop. One of the ongoing projects is the reception at our new offices at Avon Centre, Enterprise Road. Joy Muli, a design intern had the thrilling experience of using the plasma cutter after making the reception door design on CAD. The design is an Adinkra symbol for wisdom, ingenuity, intelligence and piece. With deep interest in 3D printed products, Karl Heinz has revolutionized the health and education sector by making the Juakaliscope – a 3D printed microscope which is portable, locally available and accessible at a cheaper price. After completion of his higher education as a mechanical engineer, he used his knowledge and skills to venture into business. In two years, he has built and distributed his own 3D printers and subsequently started a mass production of Juakaliscopes. Karl Heinz makes two types of microscopes: the student kit and medical kit, which vary in magnification. He prototypes the microscopes at Gearbox and tests them before mass production. These microscopes can be used to conduct water tests, medical and livestock diagnosis. Unlike typical microscopes, the Juakaliscope uses a USB cable to connect to a phone or PC. The specimen is viewed on the screen and preferably sent to a doctor for review or projected for study. Karl has been working with Sidai Africa to revolutionize the provision of livestock and veterinary services to farmers in Kenya with the aim of creating a more sustainable service delivery. With this device, farmers can now send their specimen to vets for diagnostic review from the comfort of their farms. Karl aims to extend his reach to Central Africa in the near future. In November 2016, I attended a two-day series of meetings of the World Economic Forum’s Global Council on the Future of Production, held in Dubai. At the meeting, Vishal Sikka, the CEO of global giant, Infosys Corporation, said, “Things have never changed so fast in world history and, conversely, will likely never be this slow again”. The changes he was referring to constitute what is described by the World Economic Forum as the Fourth Industrial Revolution (4IR). Just what exactly is the 4IR? It is characterized by the convergence of the physical, biological and cyber worlds through massive connectivity and massive automation. The previous revolutions brought us steam, electricity and ICT respectively, over a period of about 300 years. So what does this mean for Africa? At first glance, the broad signs are not good. Africa’s economy is still somewhere amidst the first three industrial revolutions, often closer to the first. Our portion of global trade is said to have dropped to 2% in 2013, from about 3% in the 1970s. There are low levels of skills amongst the working population, and poverty remains widespread. Globalization means that we will be sucked into the effects of the 4IR whether we like it or not, and indeed this is already happening. Jim Yong Kim, the President of the World Bank, gave a speech last year in which he said that the Bank anticipates the loss of up to 85% jobs in countries like Kenya due to automation and the effects of the 4IR. What averaged statistics about Africa’s economic status don’t tell you is about the specific activities at the far right of the bell curve, only observable at a more granular level, that portend better things. Gearbox is a space around which a supportive ecosystem for hardware entrepreneurs has been successfully piloted, creating a pipeline of innovators and invention-based businesses by removing the key constraints to developing innovative hardware products in Kenya. The main constraint from our perspective is the difficulty that most innovators in African countries face in creating high-quality prototypes with which to demonstrate the market value of the hardware innovation through a pilot. Removal of this constraint by providing access to modern fabrication tools on a shared basis can lead to investment opportunities, thereby addressing another significant impediment. A further constraint is the dearth of contract manufacturing facilities. This means that every innovator needs to establish his/her own manufacturing facility in order to meet market demand, which often results in lower competitiveness. There are also significant constraints found further upstream in the production value network. These begin with the creative process itself, with many would-be innovators not having much of an understanding of human-centred design. Even assuming one has mastered that, there are other barriers to competitiveness, such as poor product design that doesn’t lend itself to available manufacturing processes. At centres like Gearbox, often called makerspaces, innovators are taught all such methodologies. What’s additionally exciting about makerspaces is that they make modern methods and technologies available not only to engineers, but also to the class of people called makers. We in Africa are very familiar with people who have engineering in their blood, making all manner of things out of recycled bits and pieces. Many such people can be converted into makers, and this happens when they are taught to use a range of tools that are highly empowering because the engineering capacity is designed into them. Tools such as Arduino and Raspberry Pi enable amateurs, without electronics training or understanding, to make sophisticated prototypes without needing to understand in depth how the innards work. This includes coding, which pervades the electronics underlying much of what makes the 4IR work. Makers only need to understand coding peripherally in order to make powerful and marketable products, such as those used in internet-of-things devices. I have been really thrilled as I have watched engineers and makers transcend the gaps between a variety of types of productive impotence to produce very presentable working prototypes. A couple of them are enjoying significant revenues from their products already, though mass production in each case still takes place in China. We have people designing and prototyping speed governor and car-tracking devices, point-of-sale devices, all manner of control systems, and even computer numerical controlled (CNC) machines, such as 3D printers, plasma cutters and routers. The latter machines epitomize digital fabrication in which computer-generated designs are sent to the machine which rapidly and precisely converts them into products. Indeed, we are on the verge of launching our very own made-in-Kenya CNC plasma cutters and wood router into the jua-kali (informal) sector. Imagine that, untrained craftsmen, currently producing crude products, raising their productivity by orders of magnitude through digital fabrication. Centres such as Gearbox and the FabLabs, disruptive centres of all the types of learning I mention above, should be replicated across Africa. They should be seen by governments as having as much importance as building roads, laying power lines, and building information infrastructure. We shouldn’t wait for tech transfer via foreign direct investment (FDI), which I see as an unreliable form of trickle-down industrialization (unless very carefully embedded win-win terms are employed). We shouldn’t wait for the few engineers that our funds-constrained governments can educate to translate their knowledge into factories making what we need. Instead, it makes more sense to transform significant swathes of our populations into makers through flexible and abbreviated instruction at makerspaces, which then feed centres of high-level prototyping and eventual contract manufacture. Africa needs more engineers and makers, the head of Gearbox - Nairobi's leading maker-space - has told the TEDGlobal conference in Tanzania. Kamau Gachigi said that by 2050 Africa's population is projected to have doubled and needs to build economies to sustain that level of growth. Digital fabrications labs such as Gearbox are vital to this, he said. Such labs need to start building more Africa-specific hardware, he added. "These labs help people become more practical and more productive. We need many more people to develop their potential and contribute to the society." He spoke about how young engineer Simon Wachira had used the lab to create a robotic tool that could cut both metal and wood, which is now creating parts for car giant General Motors. Another project saw 24-year-old Esther help design sanitary towel dispensers which can be put up in schools to avoid the issue of girls missing school when they have their period. And a third saw a pharmacy student design 3D models of CT scans that surgeons can use to practise operations before they operate on real tumours. "He is making money selling these models to surgeons. It saves up to 60% of operation time and that means insurance companies are interested. He now has a business and doesn't need to go back to university," said Mr Gachigi. One of the projects Gearbox has handled is the fabrication of Controls Systems for Usafi's Johkasou systems that were being installed in several areas in Nairobi. These control systems were needed for the electrical components of the Johkasou system. According to Nia, the partnership Manager at Usafi Comfort, manufacturing locally is helpful to save on shipping costs resulting in savings we can then pass on to our customers. The sites included Park Villas in Karen, Liza Heights in Kinoo and a single residential in Runda. The Johkasou system in Kinoo is the biggest project Usafi has handled as it is the biggest of its kind in Kenya. It's a 60m3 system that uses five Japanese engineered energy efficient blowers.